Connar Penrod of Wauseon with a reception Friday night versus Evergreen. He had both an offensive score and a defensive score as the Indians triumphed over the Vikings, 42-7. 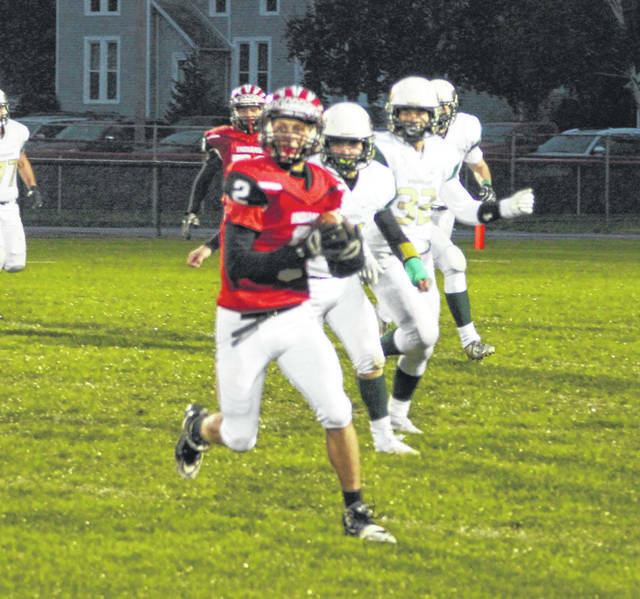 Trent Coopshaw of Evergreen bursts into the end zone for the Vikings’ only score Friday at Wauseon. Sometimes teams win games. Sometimes teams lose them. 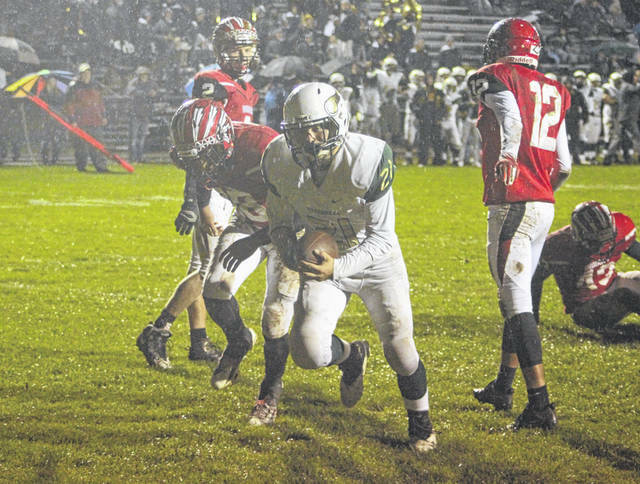 Evergreen did a whole lot of the latter as three pass interceptions and a pair of misplayed kickoffs led to scores that blew open a tight game as the Indians took a 42-7 decision over Evergreen in the rain at Harmon Field. The Indians moved to 3-5 on the season while Evergreen fell to 4-4. Cody Figy’s out route to Connar Penrod for 43 yards thanks to a couple of missed tackles led to Figy’s one yard run just over three minutes into the game, putting the Tribe up 7-0. The ensuing kickoff ricocheted off a Viking player, putting the Indians in great field position at the 47, but the Vikings held on a fourth-and-two. Evergreen came back on a long time-consuming drive that went two minutes into the second quarter to tie the game. Hunter Vanwert’s 22-yard run was the big play in the 70-yard march that ended with Trent Coopshaw’s two yard blast with 9:50 left in the half. After the Vikings forced a three-and-out, Jack Etue’s 15-yard pass to Jack Krispin helped the Vikings cross midfield but faced with a fourth-and-three, the momentum changed. Etue had Vanwert open on a screen pass with blockers in front of him but his throw went into the arms of Jaiden Falke who returned it 25 yards to the Viking 35. It took six plays for Xavier Torres to find the end zone from a yard away to give Wauseon a lead they would not give up with 1:37 left in the half, 14-7. The nail in the coffin came on the Vikings first drive in the second half when Penrod picked Etue’s throw into traffic and rambled 45 yards for a score to make it 21-7. Again on the kickoff, a Viking player made a huge mistake as he ran past the Indians bouncing kick allowing Wauseon to recover at the 33. Torres then went in from four yards away with 7:55 left in the third to boost the lead to 28-7. Penrod and Torres added short touchdown runs later to extend the score. Wauseon had 289 yards of total offense and made the most of the field position they were given during the night. The win should help to boost the Indians’ confidence for the final two games of the season. Evergreen had only 123 yards total. The Vikings next host Archbold (5-3, 2-3 NWOAL) while the Indians travel to Patrick Henry (5-3, 5-0).